I am a writer living in a suburb east of Dallas with my wife, Gina. She’s a teacher. We have a chocolate Lab, Molly, who’s almost two years old. I’m in my mid 30s and have been married almost three years. During the day I work in journalism and at night I write. It’s something I’ve done off and on my entire life. It started in elementary school and continued into junior high.There were some unproductive years in high school and college. I picked it up again after I graduated from college and have continued since. It wasn’t until I met my wife, however, that I buckled down and got serious about pursuing publication. I’m a big baseball fan. Very big baseball fan. My writing stalled last October when the Texas Rangers made their playoff run all the way to the World Series. Gina and I were at as many playoff games as we could get to. We made it to at least one game of each round. I screamed myself hoarse when the Rangers beat the Yankees to claim a spot in the World Series. A couple of nights a week I keep my baseball skills sharp by playing adult-league softball. I’m the biggest second baseman you’ll ever see. What has been the best part about publishing your first book? The worst? The best part is probably a tie between being able to search my name and having it pop up on different bookseller sites and actually getting reviews that like the book. Years ago, I would go to the book store and look in the fiction section and find where my book would be shelved if I actually had a book. I’d stick my fingers in between the books where my novel would fall. I’d make a space on the shelf for my own unwritten volume. I know it’s not the same, but being able to search my name in the digital world is the somewhat similar. And getting nice reviews is validation that you’ve produced something that someone else says is good. Writing is a solitary experience. Until you get to the end of a work, you don’t really know if you have anything good. I thought as I was writing Chasing Filthy Lucre that I had something that was good. I was enjoying it, at least. But until you hear from other people that it’s good you just never know. The worst thing, probably all the work. I know most authors, both traditionally published and self published, are left to do most of the work to market their book. I knew it’d be hard going in, but not this tough. It really is difficult. I have tried to use Twitter and Facebook to cultivate relationships. I feel like I’ve been somewhat successful. Still, it’s much tougher than I thought it’d be. Everything I’ve read said that it’s slow going at the beginning, and that’s where I am right now, the beginning. I’ll stick it out. Who are some of your influences? What do you like to read when you aren’t writing? Influences change so much. It really depends on who I’m reading at the time. A few names, though. I like Elmore Leonard for dialogue. I love Hammett and Chandler. None of this is very original, I know. As far as what I’m reading, that also depends on when you ask me. Mainly, I read genre fiction. A lot of crime. Some sci fi, but not space opera. I like my sci fi set here on Earth, or at least some place a whole lot like it. Never really got in to fantasy, but think I might like some of the urban fantasy stuff. I read young adult books to help my wife for good recommendations in her classroom for the boys. There is one YA series that I like quite a bit. It’s the Artemis Fowl series by Eoin Colfer. It’s so good. It doesn’t read like a YA book. It reads like an adult crime book. If you’re looking for something that moves, these are books you need to check out. The action starts right away and doesn’t slow down until you get to the last page. One recommendation, if you can get the older editions of the books, you should. The newer versions include drawings of Artemis and those don’t look anything like what I picture Artemis to look like. What are some of the hurdles that you run up against with writing science fiction? I don’t know that I think of myself as a sci-fi writer. I think that’s why when I first started talking about Chasing Filthy Lucre I didn’t even use sci fi in the description. I’ve warmed to the idea recently that it’s actually a sci fi book and, even more specifically, a cyberpunk book. I wasn’t against it being a sci fi book before, just never thought of it that way. So, maybe that’s a hurdle. But the biggest thing was explaining the technology in a way that wasn’t boring. I didn’t want it to read like a text book or some manual you pull from a box. It plays such a pivotal role in the story that it needed to be explained, but I didn’t want to slow the narrative down. Hopefully I succeeded. I knew you were going to ask something like this. To be honest, I always saw this is something that could be adapted to a comic book pretty well. This would probably be easier if I wrote with famous faces in mind, but I don’t. If I had to cast a movie, though, here’s who I’d pick for a few of the roles. Rexall: I’d cast Jason Statham. He already has the reputation for playing tough guys and Rexall’s tough. Berger: This is the hardest, probably. You need a big guy who’s still athletic. I’m going to go with an unorthodox choice. Give me Kevin James. He’ll need to cut his hair very short and the productions folks need to dirty him up a bit to fit into the world of Chasing Filthy Lucre. But who knows, maybe he’s looking to be taken seriously as an actor. This could be that role. Simmer: The only female. Gonna have to say this one is probably Rebecca Romijn solely based on her role in the X Men movies. She looks like she can handle the action scenes she’d be in. Raul: Javier Bardem. I never give a nationality for Raul in the book, but in my head he’s Spanish. Bardem seem to have the presence that a guy like Raul commands. He’ll probably notice that there isn’t a lot of Raul in Chasing Filthy Lucre. Maybe he’ll take the role if he’s reassured that Raul will take a much bigger role in the sequels. Carroll: This one is was also tough. I guess I’ll say Tommy Lee Jones. He’s loud and in-charge in The Fugitive. That’s what Carroll needs, someone who’s confident. Thank you Jarrett for answering the questions, and letting us know a little bit more about you. 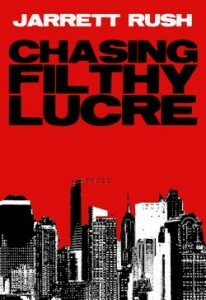 If you would like to pick up Chasing Filthy Lucre you can find it at Amazon, Barnes & Noble and Smashwords. This is a great idea for a series, Aden! There’s got to be a lot of great self-published fiction online now, just as it’s become a great place for self-produced bands and filmmakers, but it’s so hard to know where to look. Chasing Filthy Lucre sounds like a good read, and Jarrett certainly gave an interesting interview. I’ll have to check it out. There is some really good stuff out there, I’m reading two right now. (Yay, double fisted reading!) I hopefully will get the authors to answer some questions for me. 🙂 I’ve met so many great people that I really want to help get the word out about their work.